There’s no question that a wacky-rigged Senko has produced more fish for me than any other over the past fifteen years or so, despite the fact that I was comparatively late adopter of the stubby, salt-laden stick of plastic. I had my chances, but even as friends touted its merits I still held out. I shudder to think of how many fish I didn’t catch because of that delay. 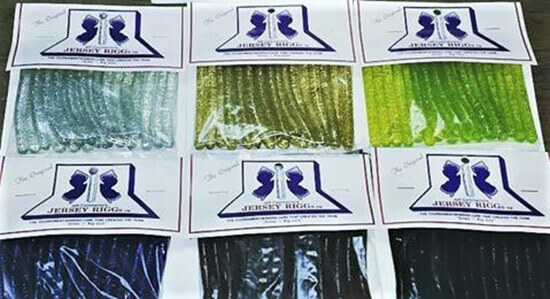 In fact, I had the opportunity to use a “Senko Substitute” a few years earlier, when a friend from NJ gave me a couple of packs of “Jersey Riggs” – even shorter, stubbier, less feature-laden worms. They had been profiled in Bassmaster Magazine and were supposedly the hot lick deal on heavily-pressured waters. They’d been invented by a guy named Jeff Cammerino, who I believe lived in Pennsylvania, but fished them on NJ lakes like Hopatcong, where the bite was often tough. Obviously they were not the first to wacky rig a worm, but it was the first time I’d heard of it. It looked too goofy to try so I stuck them in a box somewhere and pushed on. Then the Senko came along and pretty much took over that corner of the market – and there went any need to ever try to find the Jersey Riggs. I’m not sure if Cammerino or a successor still makes the little worms, but you can bet that there’s someone hoarding them for personal use or to sell on eBay. At this point, I’m all-in on the Senko, so while there might be specific conditions in which the Jersey Rigg is more effective, it doesn’t seem worth it to figure out those times. Besides, I’d have to dig through mountains of tackle in the garage just to find them.